I hear a voice, although it doesn’t hear me. It says little of interest. head might very well prevail. This selection comes from Susan Lewis’ book How to Be Another, available from Červená Barva Press. Purchase your copy here! Susan Lewis lives in New York City and edits Posit (www.positjournal.com). Her most recent books are This Visit (forthcoming), How to Be Another, and State of the Union. Her work is forthcoming or has appeared recently in such places as The Awl, Boston Review, The Brooklyn Rail, Connotation Press, Dusie, EOAGH, Gargoyle, Otoliths, Ping Pong, Propeller, Raritan, Seneca Review, and Verse. 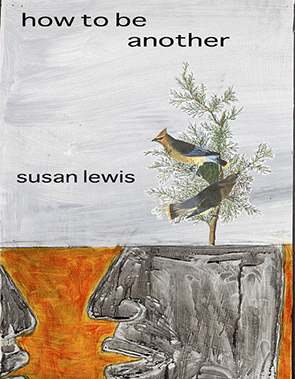 More at www.susanlewis.net. Marika von Zellen has a BA in English and Creative Writing from Cornell College (no, not the one in Ithaca). She’s had poetry and fiction published in Open Field, Temporary Infinity, The Grin City Monthly, and the anthology Rock & Roll Saved My Soul. As an Editorial Assistant for Sundress, she’s copy-edited the book Picture Dictionary (2014); as a freelance editor she copy-edited the photography book Face It (2013). In the summer of 2012, she attended the Grin City Collective Artist Residency in Iowa. Besides writing, she enjoys theoretical physics, playing piano, ghost-hunting, climbing trees, and drinking good Czech beer. She’s also a scholar of Lewis Carroll.